I was working with director Les Blank on his bio, coming up with adjectives to describe his work. I knew better than to suggest “eccentric”, but even my polite proposals were upsetting him more and more. “Idiosyncratic” left him flushed with pique, and “offbeat” drew an agonized wince, but “quirky” inflicted a full-fledged coup de grâce. Words such as these had obviously been used as cudgels by non-comprehending squares to patronize Les and his sublime films. “I had thought idiosyncratic meant quirky, “ Les replied. “But if it’s good enough for Salman, it’s good enough for me.” So “idiosyncratic” it was. Liveliness is dismayingly rare. We have the mistaken notion that people working in the creative arts are creative; that they have highly original visions and march to staunchly different drummers. But the sad truth is that even beyond the highly prescribed realm of, say, Shrek, the artier indie and documentary film scenes can be just as brutally formulaic in their own way. Sometimes even more so. After all, there’s nothing more crushing to the creative spirit than lockstep non-conformity. The problem goes way back. How open-minded were the Pilgrims after escaping all that horrible repression? People who hold fixed ideas about art are the agents of conformity, exerting pressure via their preference for blinkered reiteration. So when a Les Blank appears, crafting wildly personal films which flout pretty much every convention Les hadn’t himself created over his 50 year career, the aforementioned squares had little choice but to view his “quirky” choices with condescension. Ill-fitting by design, genuine creativity gets relegated to a small drawer of odds and ends. 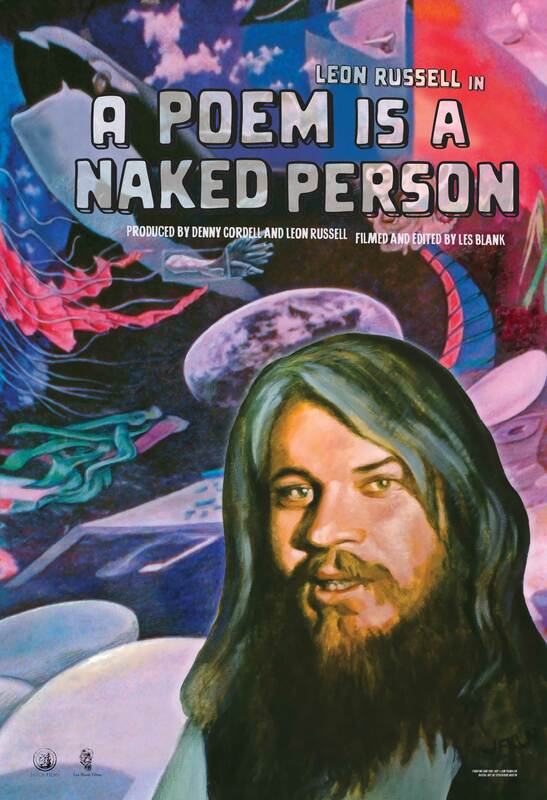 Les Blank in a screen grab from A Poem is a Naked Person. This was particularly frustrating for an ambitious guy like Les. He chose earthy, funky subjects to portray with commensurate funky earthiness, but sought to make grand movies about these small subjects. While other filmmakers shoot with aloof dispassion, Les got right in there. 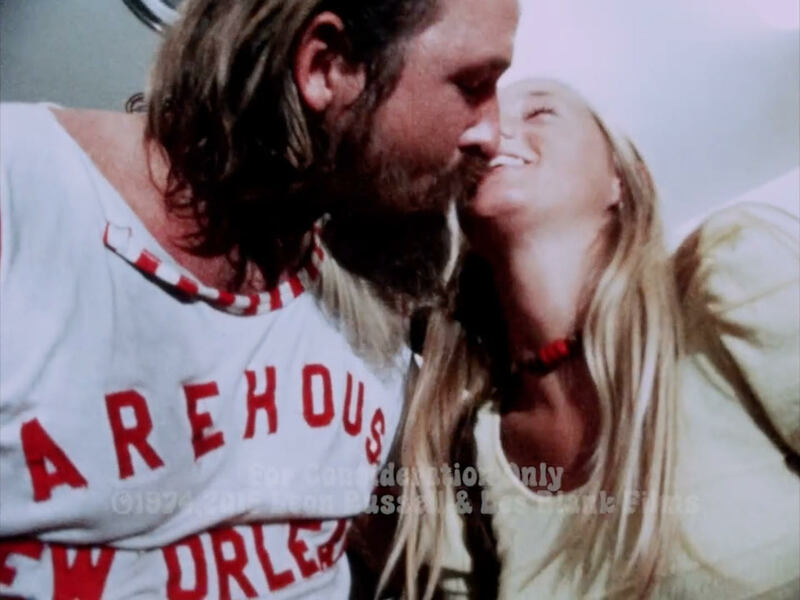 At an emotional high point of A Poem Is A Naked Person, Les, unidentified among a crowd of revelers, kisses the bejesus out of a random young ingénue until her features light up like a sun. Squares might reproach the seemingly indulgent lack of discipline. They’d also likely confuse the staunch anti-slickness with sloppiness. But Les was a phenomenally disciplined and meticulous filmmaker. Nary a frame evaded his full-hearted consideration. Uninterested in making the film you’d expect, he was reaching for a pure, vibrant expressionism. What mattered was the personal heart of the matter … his and his subject’s, both. When his films click, both are unified, and audiences have no choice but to merge in, as well. A Poem Is A Naked Person, his long-unreleased masterpiece from the early 1970s, was a particularly strong click. It certainly wasn’t easy. 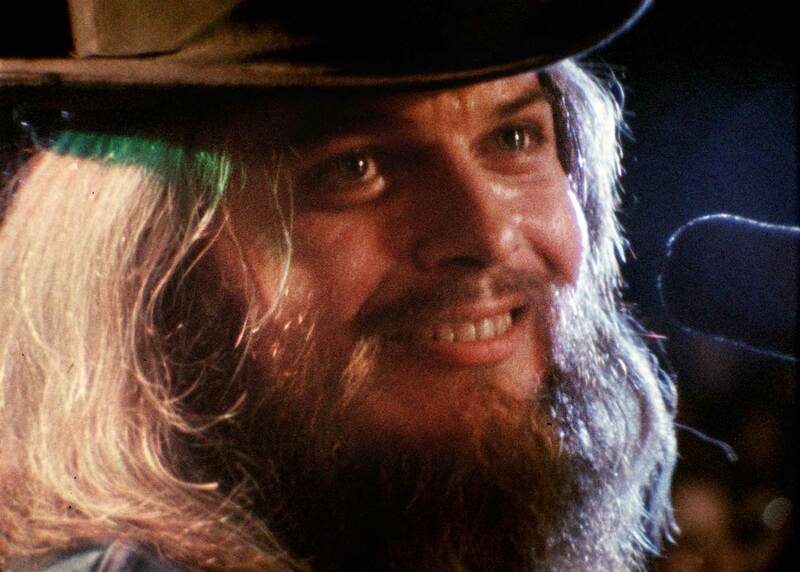 The subject, musician Leon Russell, whose business partner had commissioned the film, barely consented to appear on camera outside of performance footage (a particularly hot gig in Grand Lake of the Cherokees, Oklahoma), leaving Les alone on Russell’s vast Oklahoma bourgeois hippy campus for months on end while he toured. The devil made use of Les’s idle hands, prompting him to shoot scorpions being picked off the sides of an empty swimming pool, downtown Tulsa buildings being demolished, a skydiving instructor chomping on a beer glass, and a host of other whimsical, and (dare I say) quirky vignettes. 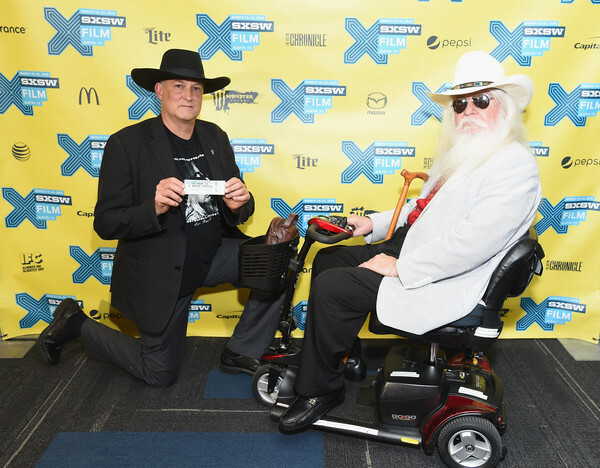 Leon Russell at the 2015 SXSW premiere of A Poem Is a Naked Person. Every scene has something to say, even if the larger meaning’s a bit wavy, like text in a dream. This isn’t an auteur showing off his profundity. In keeping with its subject, the film’s vibe is ecstatic rather than cerebral. There is, however, one sardonically on-the-nose nod to classical cinematic metaphor when a massive snake devours a baby chick as the soundtrack discusses the evils of global capitalism. So, you wanted subtext? Behold the grisly demise of this adorable chick. Now, are you sure you want subtext? The wryly off-kilter vignettes and digressions, each as fancifully and wickedly self-amused as Russell’s acid-trip top hat, assemble to evoke the saucily fragmented charm of an old-time quilt — or of a Leon Russell gig. Weaved with great music from Russell — along with friends such as George Jones and Willie Nelson — the whole is more than its parts, soulfully expressing a singular vision, and inductively illuminating Russell’s music and the Oklahoma roots from which he sprang. Opens Friday, July 10, 2015 at Landmark’s Opera Plaza Cinema in San Francisco and Landmark’s Shattuck Cinemas in Berkeley. Click here for a list of regional playdates. Writer and jazz trombonist Jim Leff founded Chowhound.com, and he slogs at jimleff.blogspot.com. 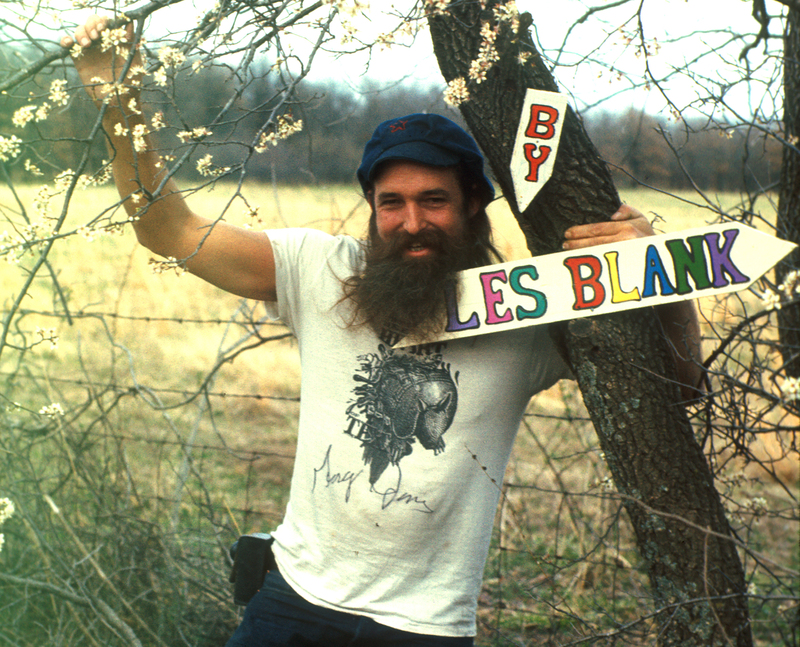 Read his memorial for Les Blank here. This entry was posted in Films and tagged A Poem Is a Naked Person, Films, Jim Leff, Les Blank. Bookmark the permalink.